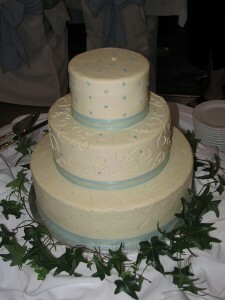 This stunning cake is finished in fondant, with different treatment for each of its three layers: the bottom layer features a quilted pattern; the middle layer has buttercream piped in an intricate-yet-uniform swirl, with an accent of random, baby blue dots; and the top layer is peppered with dots in a triplicate pattern. And, in a move that we haven’t seen before, the baker uses a satin and sheer ribbon to trim each layer of moist yellow cake. Silk ivy (a good move, since the real thing is poisonous) trims the cake around the base, hiding the generic cake board. Simple and beautifully executed, and a good play of color used with a light hand. The elegance of this cake would translate to any color palette favored by the couple. But we especially like the use of uber-traditional blue.